I won an award at the ASID Awards Gala last week! 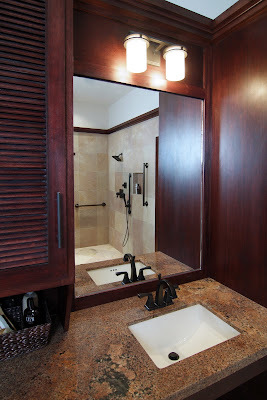 I had entered one of my master bath remodel projects and it won an Honorable Mention! Photos of the winning project are shown above. 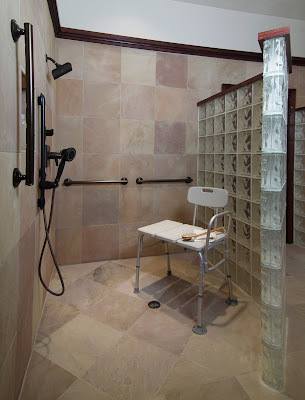 My wheelchair bound client needed accessibility but did not want it to be obvious. A masculine feel with spa-like quality was desired. Walls needed to come down to provide a luxurious roll-in shower and side entry toilet. Direct access to the sinks was allowed when storage shifted to the side and the countertop was floated on the wall. 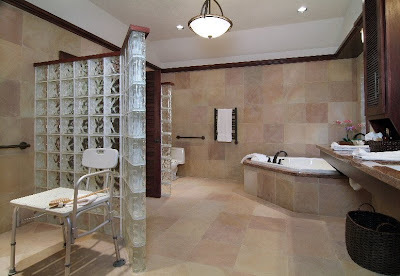 A reddish toned slate, “painted desert” was used on the walls and floor to continue the exterior brick wall color into the bath and served to marry the indoor space with the garden. Dark mahogany was a rich accent and made beautiful cabinets and trim. 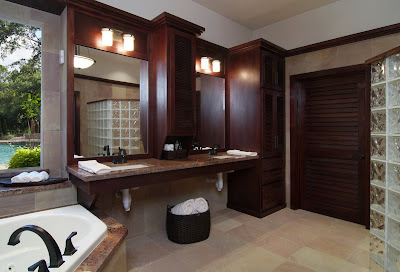 The 3 ft. wide louvered mahogany doors added for ease of entry into the bathroom and closet, created a spa-like ambience. The glass block partitions provided some privacy while visually keeping the space open. During the course of this project, I became interested in universal design and took a course through the GHBA to become CAPS certified. CAPS stands for Certified Aging in Place Specialist. My goal is to design projects that are accessible and beautiful. This project later won a national award from the NAHB Remodelers in 2010, the Homes for Life Award, single space. I received this in Baltimore at their awards gala. Such a thrill! I was really moved though when I found out through the next homeowner of this house, in the fall of 2011, that my client had lived in this home until he passed. The changes he had made to the property enabled him to be at home instead of in a hospital.